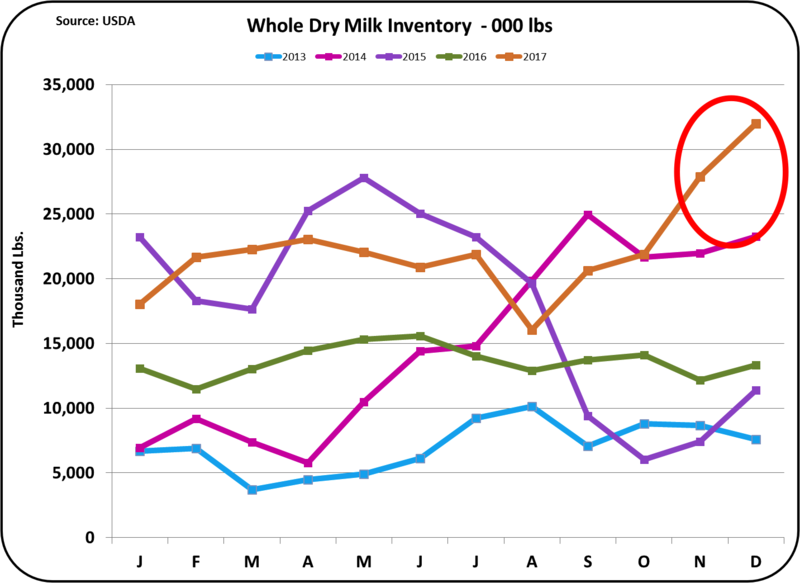 In the February 5 post to this blog, year-end inventories of dairy products were reviewed. They were mostly very high, which has kept the prices of these commodities low and therefore kept producer milk prices low. In the prior post, cheese exports were reviewed. They were up considerably over the prior year and were the second highest ever. The missing pieces in the milk pricing logic link were imports, domestic consumption, and production. This post will review the impact of 2017 imports. The emphasis is on cheese as the price of cheese is the most important parameter in the calculation of producer prices. 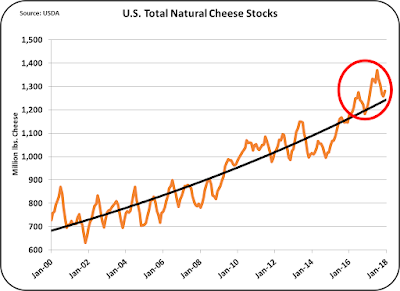 See this prior post for analytical proof of the importance of cheese prices. 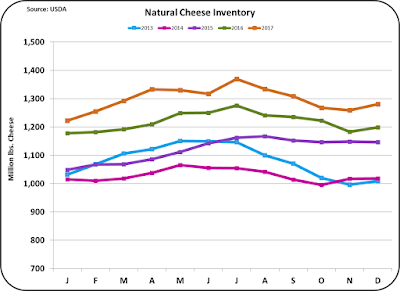 Chart I below shows the inventory of cheese and the trend line of these inventories. The inventory level has not been this much above the trend line since the year of 2000. With cheese inventories this high, there is bound to be low cheese prices. 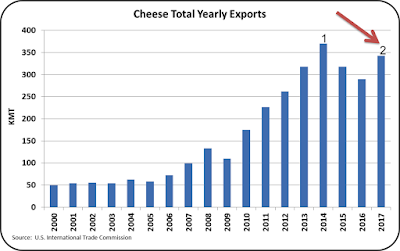 Chart II shows the level of cheese exports by year since 2000. The year of 2017 was the second highest export level ever and showed a significant increase from the prior year. Exports of cheese were reported to not only be improving significantly but also showed strong momentum going into 2018. 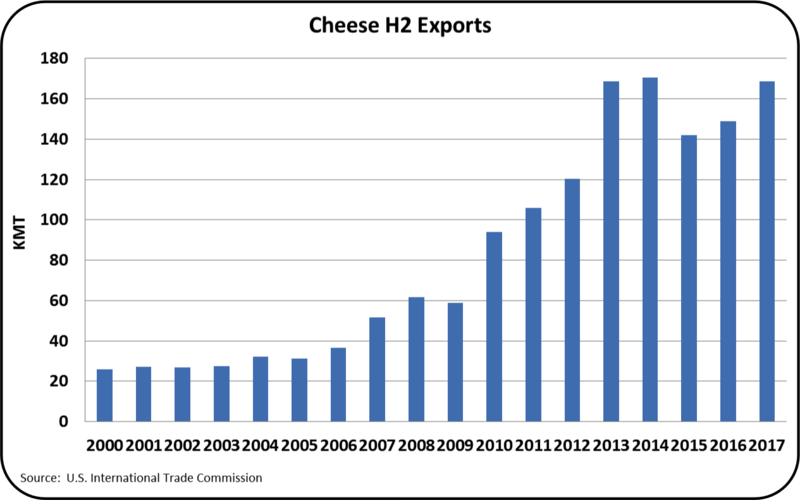 Higher exports help lower the bloated cheese inventories. Lower cheese imports also help lower inventory levels. 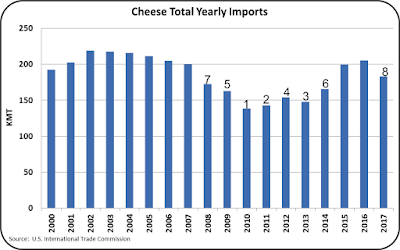 Chart III below shows the cheese imports by year through 2017. 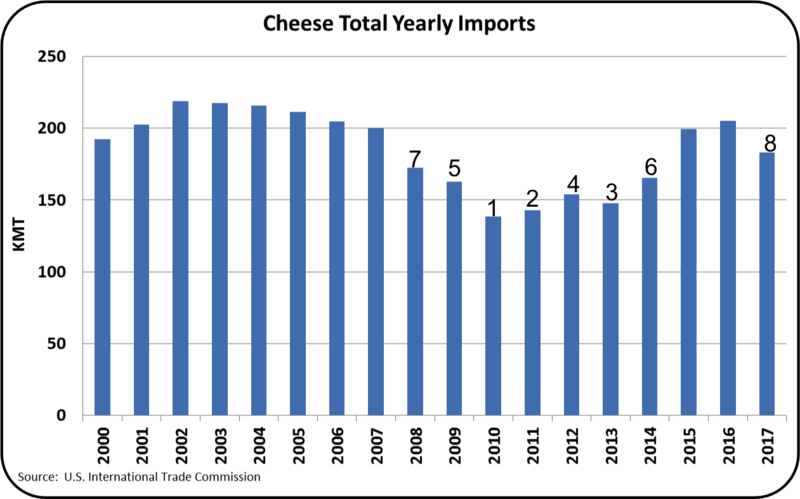 The imports of cheese for 2017 were significantly below the prior year which was very positive. However, there are seven prior years that were lower. So while 2017 showed significant improvement with lower imports, by recent historical levels, imports were still high. Why are imports still a problem? 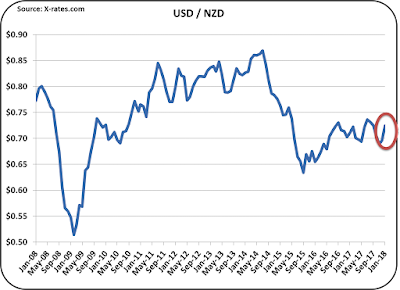 The two big competitors to the U.S., are the EU and New Zealand. 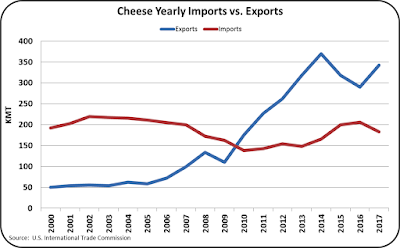 Both have excess cheese to market and U.S. purchasers have found these buying opportunities and taken advantage of them. There are limits to the amount that can be imported without significant tariffs, but those limits still allow significant cheese imports. See this prior post for a review of the two tiered tariff system. 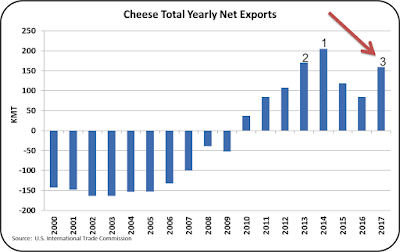 As a result, the net exports shown in Chart IV are only the third best ever (as compared to cheese exports which were the second best.) From this, one can conclude that imports remain a problem in recovery of producer milk prices. This is a problem that can only be solved with lower production of cheese in the EU and New Zealand. There is very little that can be done in the U.S. to limit these imports. Global over-production of cheese is a difficult problem for the U.S. to solve without tighter tariff limits. The price of butter has a much lower impact on the Class III price than cheese, so less space will be dedicated to butter. 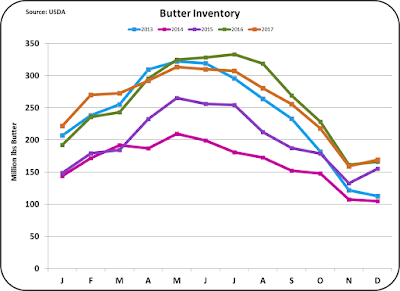 Domestic inventories of butter (See Chart V) are not excessive, unlike cheese. 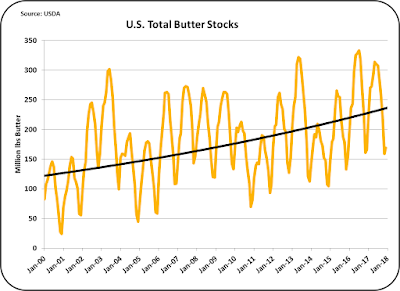 With inventories in line with the trend line, prices of butter are good. As covered in the prior post, exports of butter are minimal with most of those exports going to Canada. 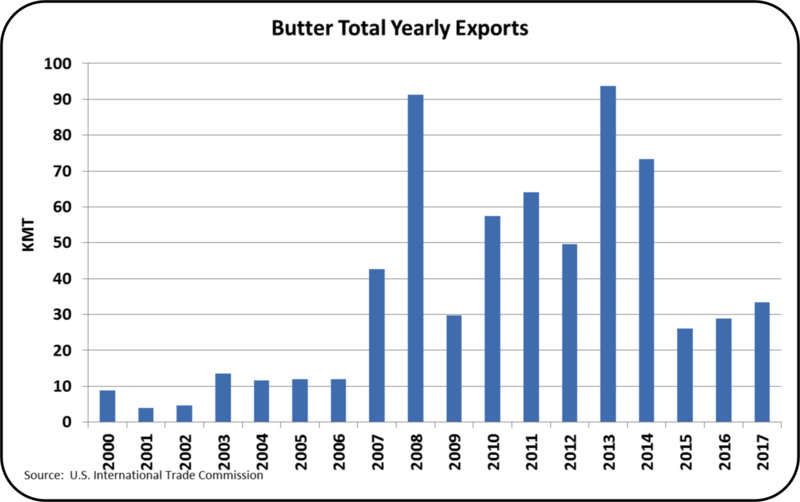 As shown in Chart VI, exports of butter for the last three years have been far below the prior decade. 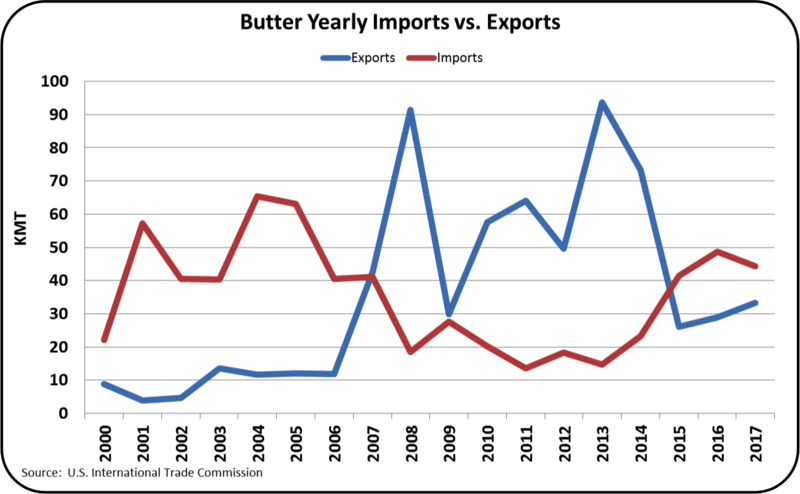 With inventories in line, there is no reason to push for additional butter exports. 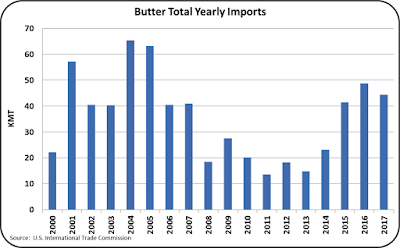 Imports of butter for the last three years are robust compared to the prior seven years. 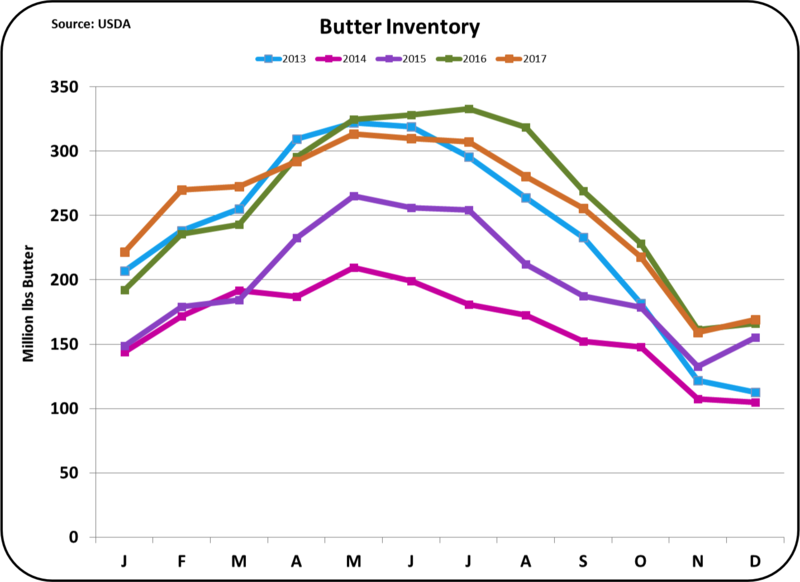 More imports and/or greater churning in 2018 would not significantly hurt the balance of inventories, and therefore butter prices will probably remain high. However, and unfortunately, butter and butterfat prices have little impact on the Class III price. The export/import comparison between cheese and butter is illustrated in Charts VII and VIII. 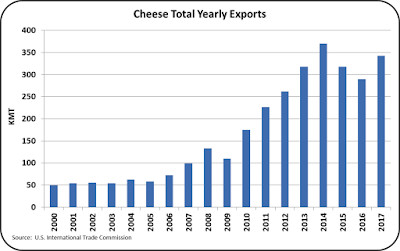 The U.S. is a net exporter of cheese, with increasing exports and declining imports. 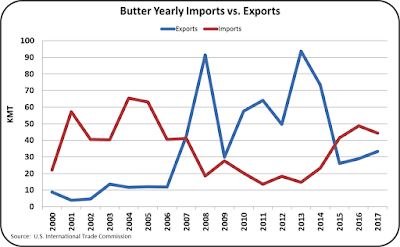 The U.S. is a net importer of butter with increasing exports and declining imports. There is an important difference between cheese and butter exports and imports. 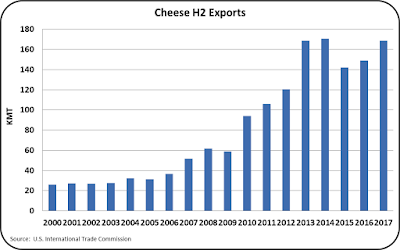 In order to balance inventories of cheese and thereby increase Class III prices, more cheese exports and fewer cheese imports are desperately needed. Butter is very different. 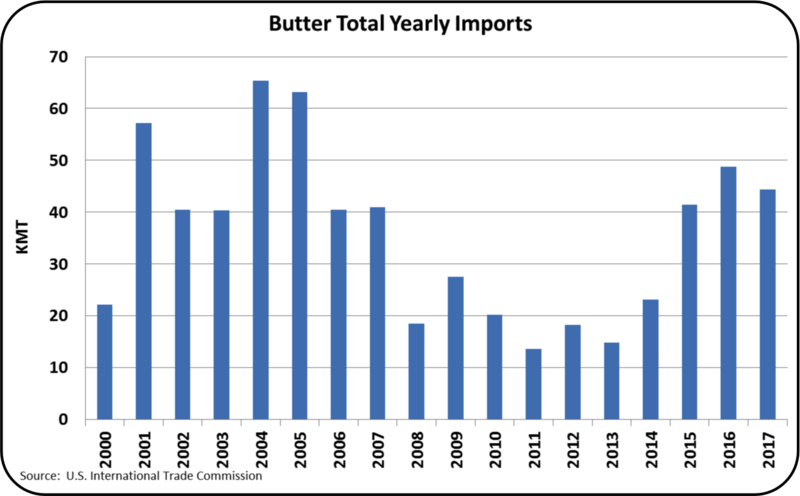 Increasing exports of butter will make meeting U.S. domestic demand difficult and will put pressure on more, not fewer imports. 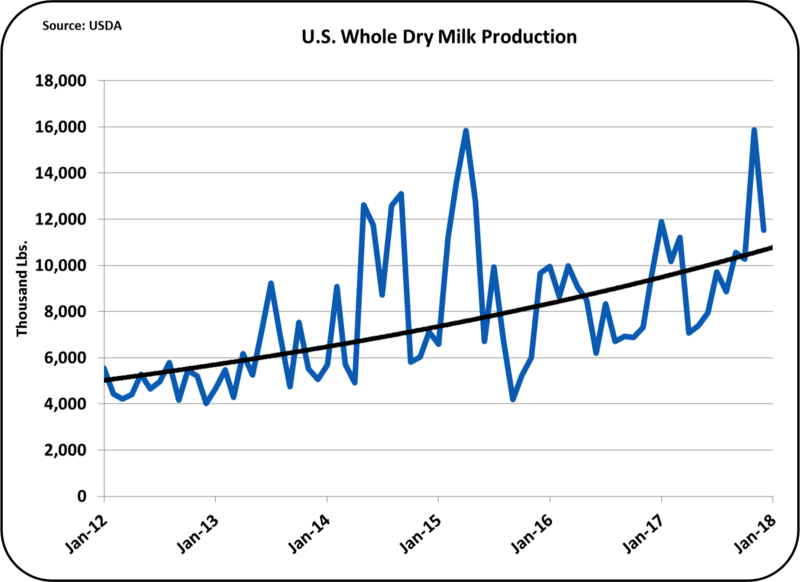 Also, if U.S. butter production is increased, there will be more skimmed milk available which will increase nonfat dry milk and skimmed milk powder production. 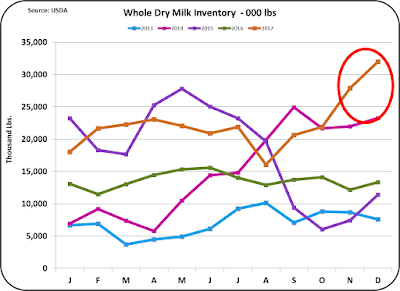 The inventories of nonfat dry milk and skimmed milk powder are already way too high! Producing more of what you already have too much of aggravates the problem. Therefore, to raise Class III producer milk prices, the emphasis needs to be directed to cheese, not butter. Upcoming posts will review 2017 imports of nonfat dry milk and dry whey. With most 2017 data now available, consumer consumption trends will be reviewed again. Also, trends in production will be analyzed. If there are other areas of interest or concern, please leave a comment. Typically, statements in this blog blame high inventories of dairy commodities for low dairy commodity prices and low producer milk prices. High cheese inventories are especially sited for low producer milk prices. The high inventories are blamed on too much milk and not enough exports of the dairy commodities used to price producer milk. The full year 2017 export statistics are now available and there is clear evidence of export growth. 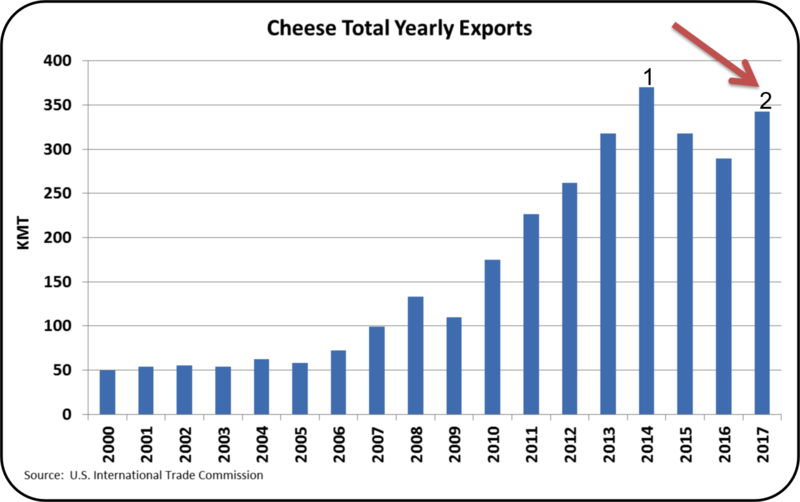 Dairy exports for 2017 were significantly higher than the prior year and, very importantly, there were significant gains in cheese exports. 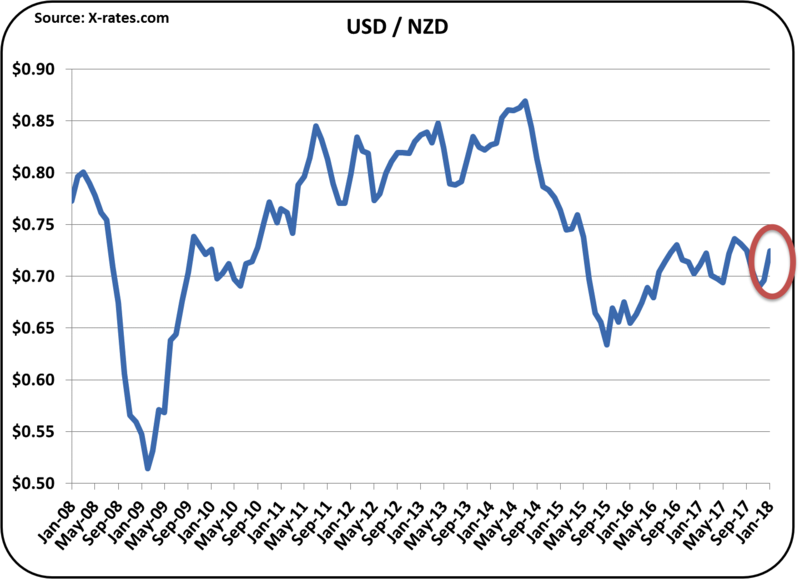 To reduce the very high inventories reported in the prior post, exports will need to continue to increase in 2018. 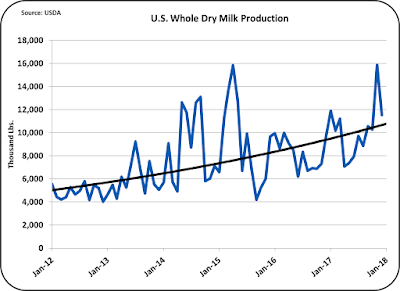 The past imbalance between supply and demand has increased inventories, which will still require lower milk production and higher exports before balance can be reestablished. 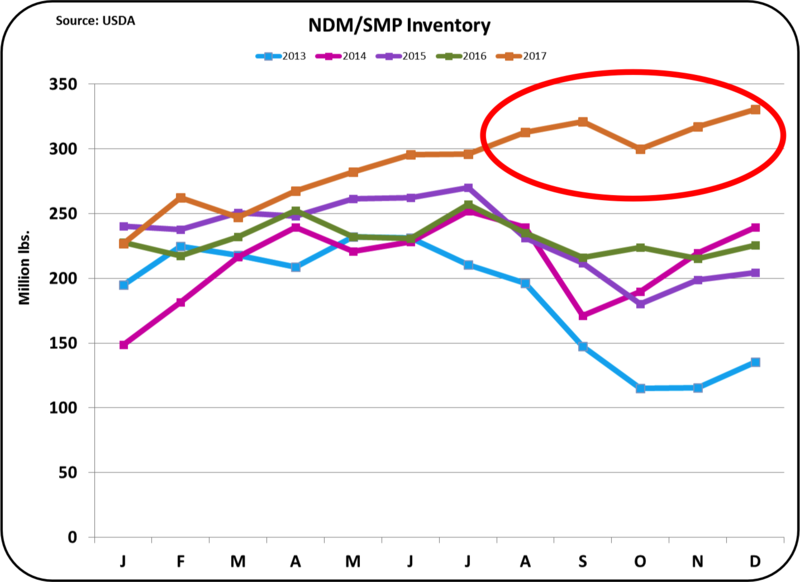 In other words, while 2017 was a tremendous year in terms of improved dairy exports, to bring supply and demand in balance, even more dairy exports are needed in 2018. The analysis below does show momentum building for increased 2018 exports of cheese, which would reduce domestic inventories and increase cheese and Class III milk prices. As shown in Chart I, 2017 exports of cheese were the second highest ever and were significantly higher than the prior year. Now, 2018 must continue with even higher cheese exports. 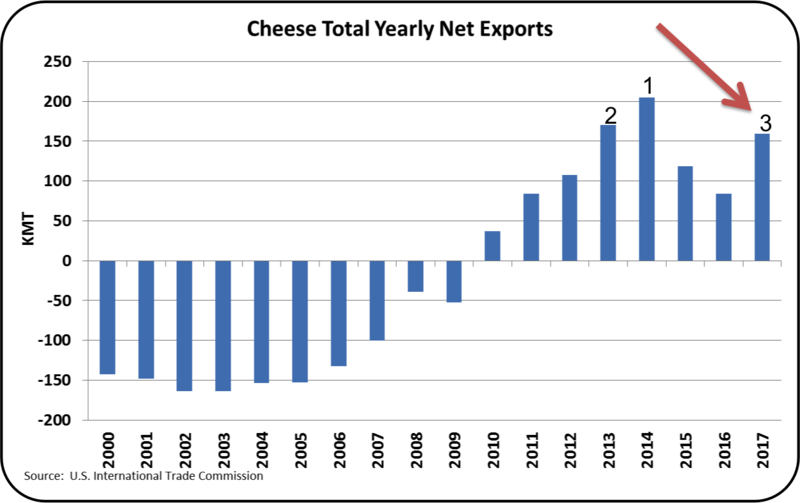 In the second half of 2017 (Chart II), exports of cheese were stronger than the first half and matched the two best years ever, 2013 and 2014. These statistics show that significant gains were made in 2017 with much of that in the second half indicating that there is momentum for further increases in 2018. 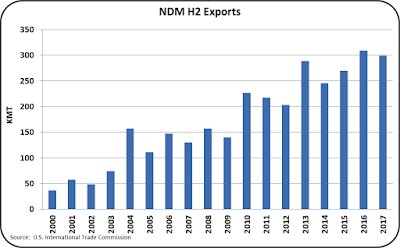 As shown in Chart III, NDM/SMP exports set a new record for the year 2017. International sales of NDM/SMP have been tough as there is an excess of NDM/SMP on the international markets. Overcoming this tough market and setting a record high is a significant achievement. 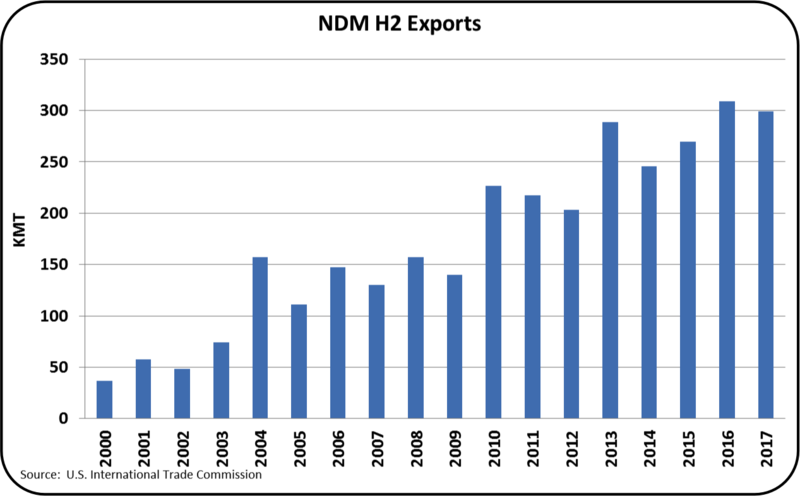 Chart IV shows NDM/SMP exports for the last half of 2017. 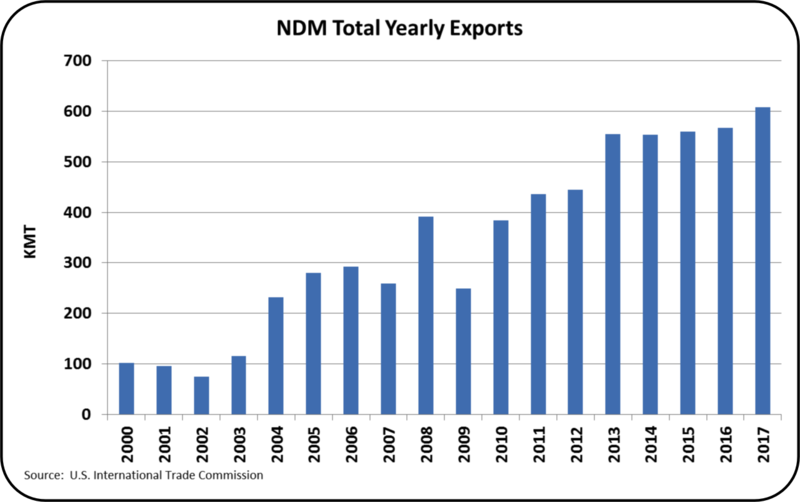 Unfortunately, in the second half of 2017, exports of NDM/SMP showed a slight decrease from the prior year. Unlike cheese, NDM/SMP has no momentum in exports to carry forward into 2018. 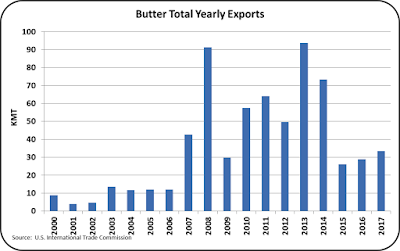 Butter exports have been almost nothing for the last three years. Exports for 2017 were above 2016 and exports for 2016 were above 2015. While the yearly increases look good, they are based on small numbers and are of little significant. Most of the butter exports go to Canada. Charts V through VIII show the exchange rates for the biggest global dairy competitors, Europe and New Zealand, and the largest dairy customers, Mexico and Canada. 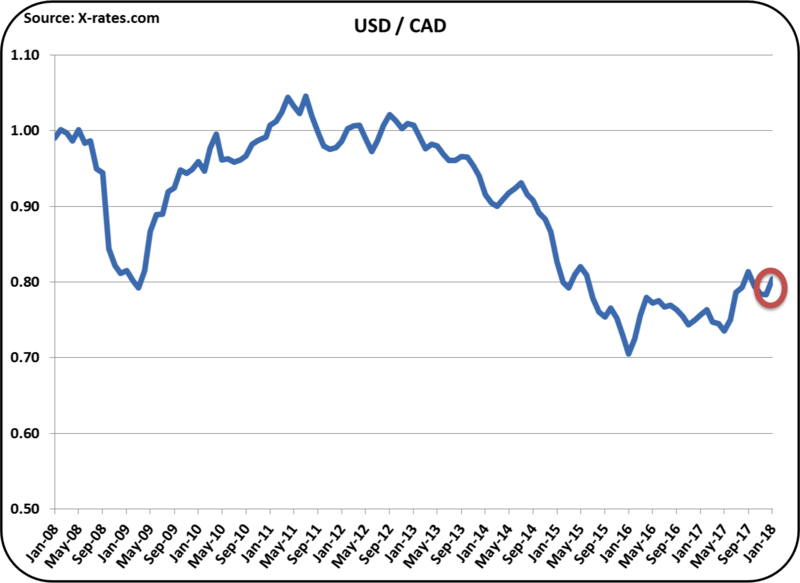 There has been a lot of discussion in the news recently as to whether the USD should be weaker or stronger. 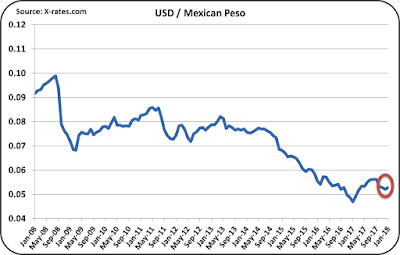 If the USD is weaker, it helps make the U.S. exports more competitive in the international arena. 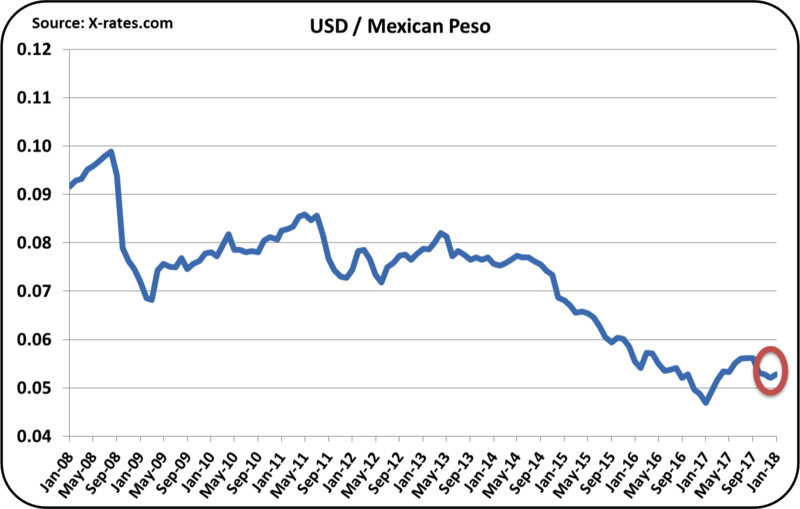 However, a stronger USD favors companies who are bringing cash back to the U.S. from other countries. The recent tax code revisions included incentives to bring cash back to the U.S. A weaker USD makes this more difficult. 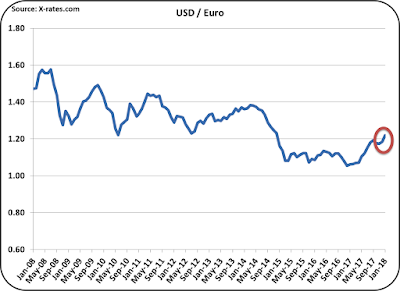 In all four charts below, the USD is continuing to get weaker, favoring exports. The futures markets are showing a slight increase in Class III prices during 2018. 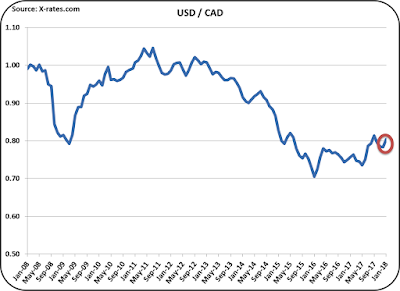 However, the increases are contained in the $15/cwt. range. That said, the strength and momentum of exports and the shrinking growth of the milk supply as reported in the prior post, signal that more positive diary prices could be on the horizon. These signs will continue to be monitored in future posts to this blog. Chart I below says it all. 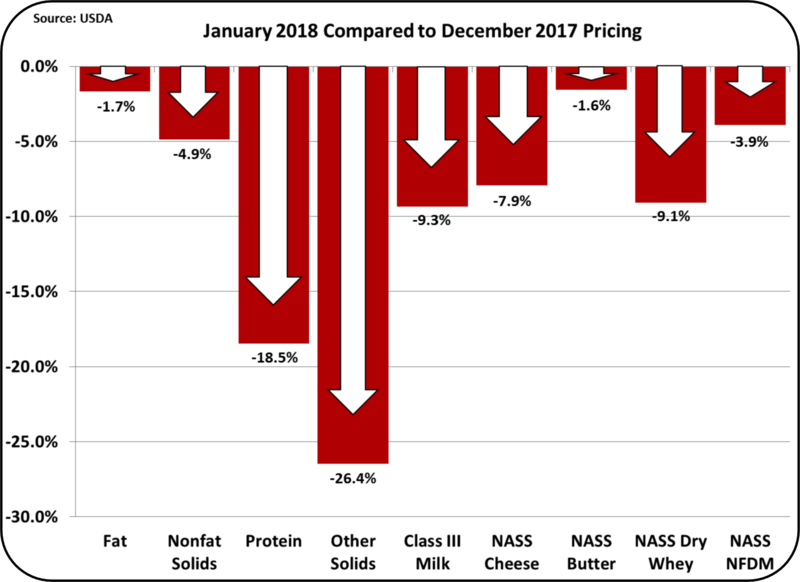 January was a really ugly month for the commodities used to price producer milk and as a result it was also an ugly month for producer milk prices. The January 2018 stats can be reviewed at this link. 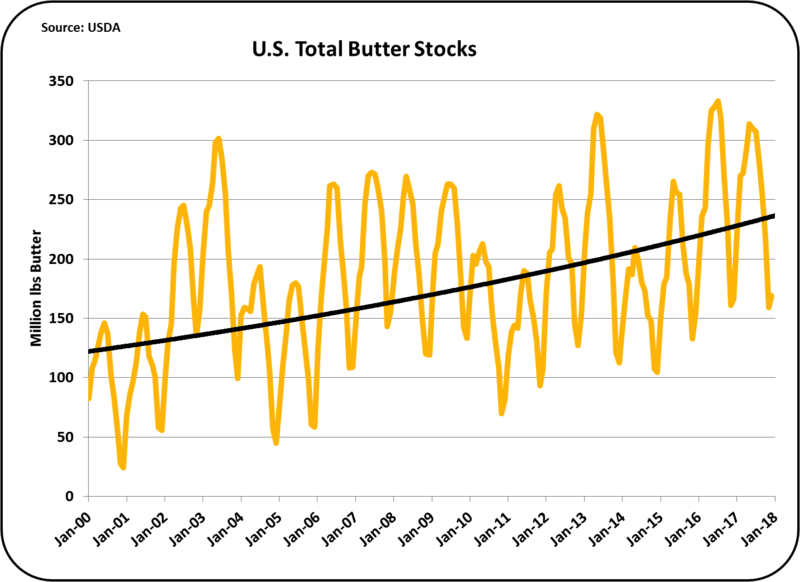 While butter and butterfat continued their declines, those declines were small compared to other declines. What's behind these declines? Too much inventory! Most of this post will concentrate on inventories. With the exception of butter, all commodity inventories are really high. 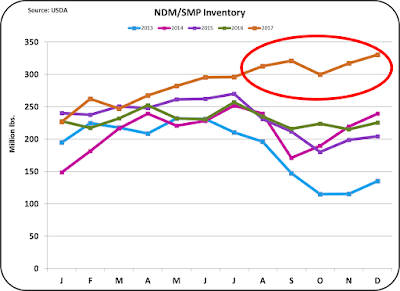 Inventory data is shown below. All of these charts represent the commodities that are used to calculate producer milk prices. The most important one is always cheese as it has by far the greatest impact on the Class III price. 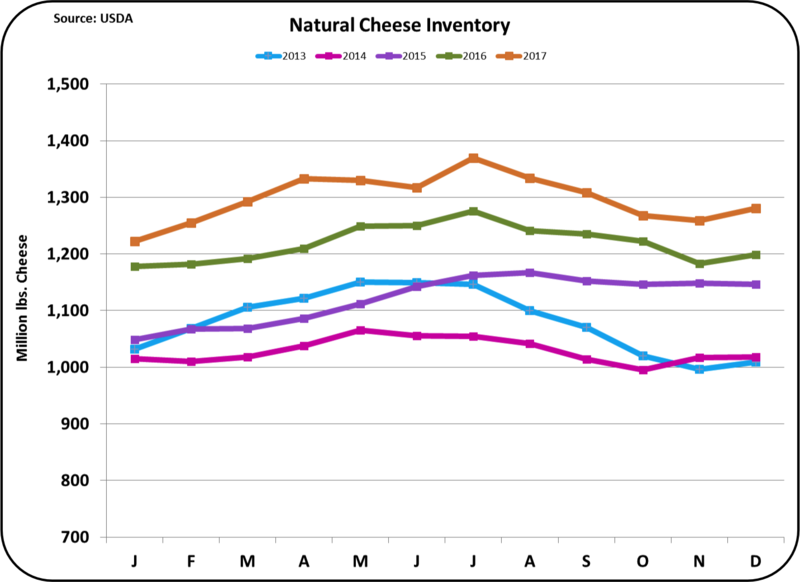 The growth in cheese inventories has been developing over the last nine months as shown in Chart II. Because the over production has been small but consistent, Chart II does not easily show the growing problem. But when viewed over the long-term, the bloat is more obvious. 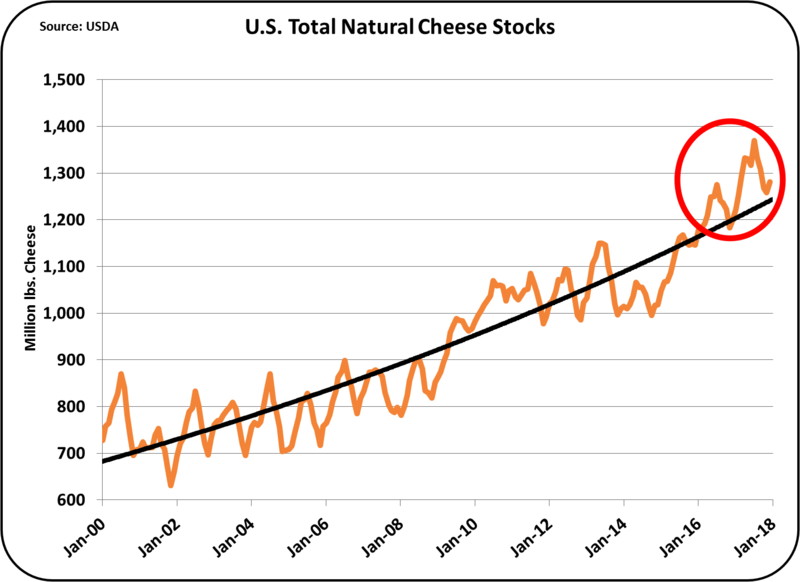 Chart III illustrates the normal in growth in cheese inventories via the black trend line. Cheese consumption has shown regular increases in per capita consumptions and inventories for nearly a century. When the actual inventory line is consistently above the trend line, there is a problem. Because of the excess milk available, cheese with its longer shelf life is viewed as a decent parking place of excess milk. Especially when milk prices are extremely low, it can be advantageous for cheese processors to produce more cheese than needed and park it in inventory for sale at a later time when prices are higher. 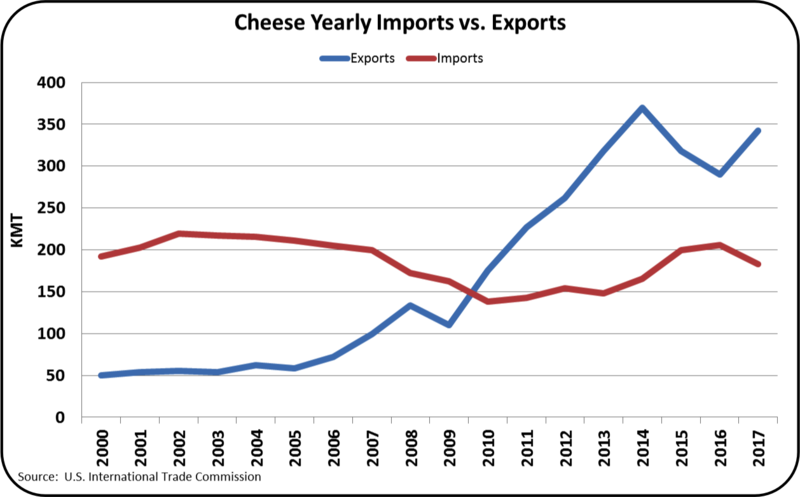 As covered in the January 14 post to this blog, exports of cheese are improving. The unknown factors are how quickly these exports can improve and for how long will there be excess milk available. There are a few charts shown later in the post that can help shed light on the excess milk dilemma. 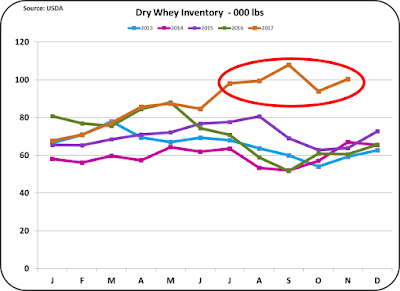 Dry whey inventories have grown tremendously over the last five months (See Chart IV). The same dilemma described above for cheese is apparently impacting dry whey inventories. Typically whey is not dried unless there is a market for it. 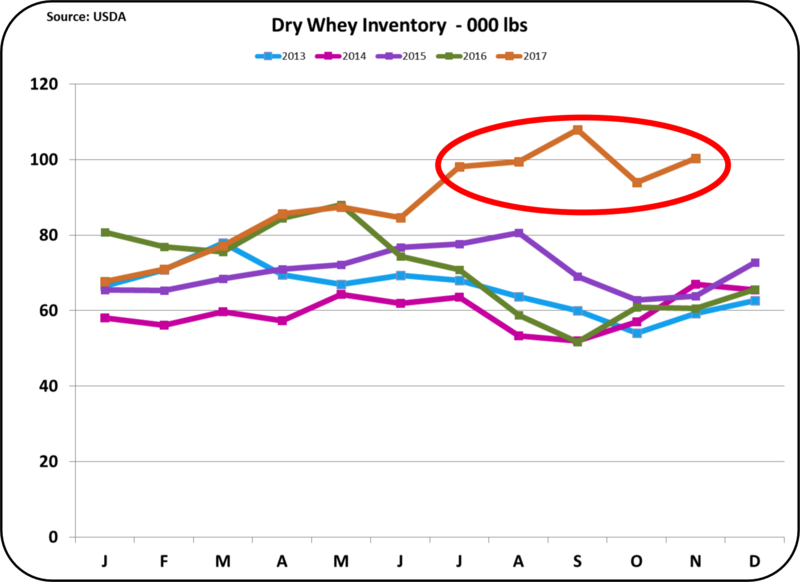 However, drying whey can provide a longer shelf life and when the price of whey is very low, it is tempting to create inventories that can be sold later at a higher price. However, the excesses must eventually be reduced. More Nonfat Dry Milk/Skimmed Milk Powder (NDM/SMP) is available internationally than can be used and international prices are low. The increased domestic and international consumption of butter has put pressure what to do with the skimmed milk. One-way of "kicking the can down the street" is to dry it. As shown in Chart V, inventories have sky rocketed. As with dry whey, these excessed must eventually be dealt with. The price of NDM/SMP is used to calculate the skimmed price of Class IV milk. The price of whole milk powder is not used in FMMO formulas for pricing producer milk. However it does have a huge international market opportunity. Because there is no domestic market for whole milk powder, the U.S. has not materially participated in this market. However, it is an opportunity for the future. As shown in Chart VI, production of whole milk powder has doubled in the last five years. Currently, inventories of WMP have reached record levels. Apparently it has also become a place to send cheap excess milk. Butter is the only commodity used to price milk that does not have an inventory problem. Inventories did hit a record for the month of December, but it was a very slight record. There is some good news. Milk production is dropping to more reasonable levels. 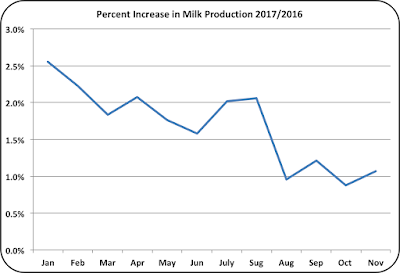 The low January producer milk prices may further decrease production as less efficient or thinly financed producers may be forced to leave the market. The data has been adjusted to eliminate the impact of the 2016 leap year. The year 2017 started with an increase of 2.5% over the prior year. 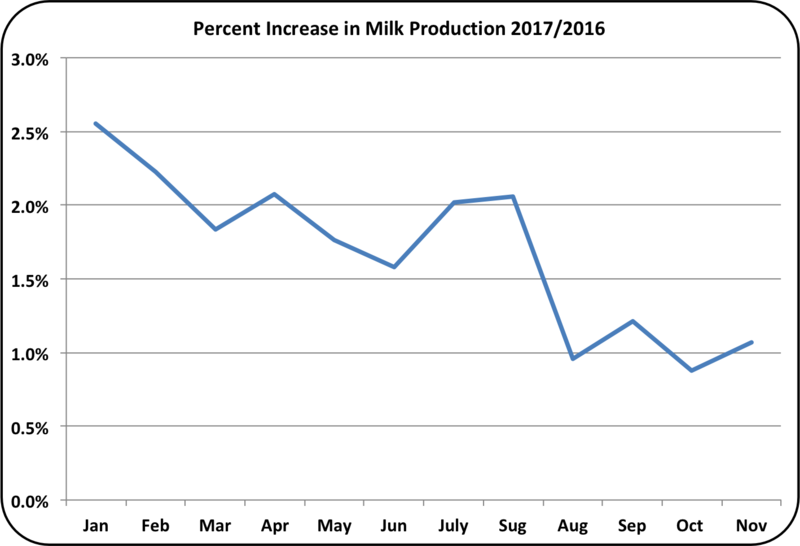 For the last four months of 2017, the increase has dropped to a more manageable 1% level. This should help eliminate further increases in inventories, but the existing high inventories must still be managed down. The next post will review dairy imports and exports.